It was a project he signed up for a young inventor’s contest held by Indonesian knowledge foundation LIPI. Brilio.net - Riding motorbikes in a tropical country can get our heads to sweating. Young Indonesian student Linus Nara Pradhana thought up a solution by creating a helmet that gives cool sensation to the wearer’s head. 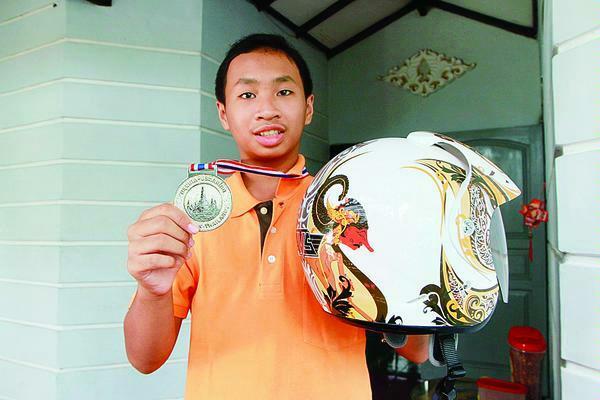 Pradhana who was born on April 7, 1999 in Sidoarjo was in 6th grade when he invented the helmet. It was a project he signed up for a young inventor’s contest held by Indonesian knowledge foundation LIPI. “At first some people doubt that (the helmet) is my invention, but some are supportive,” said the finalist in National Young Inventor Award 2011. The helmet was then exhibited at a similar international event Exhibition for Young Inventors 2012 in Thailand. Pradhana won the gold medal defeating the other 261 junior high school students; six of which were from Indonesia. The invention was considered to be simple, easy to apply, and at the same time offer a huge impact for millions around the world. The helmet might look ordinary from the outside. But the interior is layered with heat insulation material that is usually used for baby’s diaper. The sodium polycrylate contained in the layering drops the temperature up to 21% of the previous condition. He made a hole on the helmet surface and injected water into it. The layer then turns into gel when it meets water. It can be stored up to 100 milliliters to keep the helmet cool. The idea came from his teacher father Gunawan Siswoyo who was always feeling hot when riding his motorbike. Pradhana then created water-injected helmet but found that the water evaporated quickly. His father helped him to get the best formula. “The original idea always comes from Nara. I was just guiding him to realize his ideas,” said Siswoyo who teaches in the SMP Kristen Petra 3 for nearly 30 years. Pradhana named his invention the “Gel Coated Helmet”. The invention also captured the attention from Indonesian helmet producers. PT Sentral Bahana Ekatama (SBE), the company that produce AVS helmet brand, bought Pradhana’s patent to bring it into a mass production. From the purchase Pradhana, who is currently in his 8th grade in Christian Junior High School Petra 5 in Surabaya, could buy a house, a car and fund the rest of his study to the university. This helmet is not his only creation. He likes science and experimenting, even since he was 8 years old. In the past 4 years, he invented a paper spider web, a tool to cut apple, a garbage can that produce liquid fertilizer, fragranced urinal without using water, and an eco-friendly biodiesel energy source from the seed of Ketapang fruit. Next, he developed a concussion-preventing helmet. The invention called “Cool Impact” had delivered him as a finalist at Indonesian Science Project Olympiad (ISPO) in late February 2016. To realize the idea Pradhana needed 5 months of research at the SMP Kristen Petra 5 lab, the PT Sentral Bahana Ekatama office, and Balai Konsultasi Industri (Center for Industrial Consulting). The helmet contains a salt-like pink powder and liquid chemicals in different plastic containers that will be mixed when an impact happens. The collision of these chemicals will trigger an endothermic reaction inside the helmet that drops the temperature from 32.2-Celsius degree to 11.5. The cold liquid will then function as compression for the head. “The cool temperature will only last for 25 minutes. It serves only as first help,” said Pradhana while refusing to mention the name of the chemicals out of the contract he made with the helmet company. The Cool Impact Helmet is named after Pradhana’s name, Naravation, by the management of PT. Sentral Bahana Ekatama. Up Next: Feeling fat? Try these 3 easy ways to lose weight using colours!